Heath was born in Henrietta, Tx and grew up in Wichita Falls, Tx. He attended Midwestern State University and Vernon College where he rode bulls for the Vernon College Rodeo Team. Heath now resides in Weatherford, Tx with his wife Judy and their two daughters. 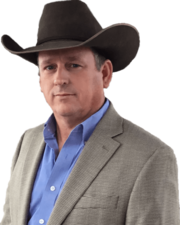 Heath grew up around the rodeo and western lifestyle and spent over 15 years as a professional bullrider. He also was a self employed contractor and has twenty years in the home construction business.